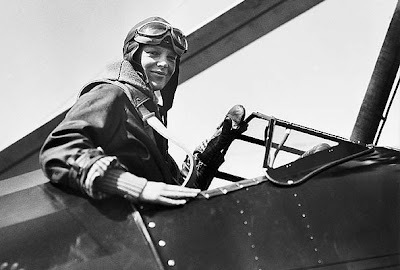 Pratana Coffee Talk: AMELIA EARHART'S PLANE FOUND? A team of researchers seeking to solve the mystery of aviator Amelia Earhart's 1937 disappearance say a sonar image taken from just beyond the shore of a remote Pacific island could be a piece of wreckage from her plane. A forensic imaging specialist for a research team that conducted a $2.2 million expedition to the island of Nikumaroro searching for Earhart's plane last year said the image could represent a wing or part of the fuselage from Earhart's aircraft. Earhart and her navigator, Fred Noonan, departed Papua New Guinea on July 2, 1937, during her quest to circumnavigate the globe along an equatorial route. But they disappeared that day and emergency searches did not locate them. The International Group for Historic Aircraft Recovery (TIGHAR) said it needs to send an expedition back to Nikumaroro, in the Republic of Kiribati, to verify that the image of something apparently lodged below an undersea cliff represents a piece of Earhart's plane. TIGHAR released images last year from the July expedition to Nikumaroro, 800 miles southwest of Honolulu, that it said could be a field of man-made debris with remnants of Earhart's plane. The latest sonar image was spotted in March by a member of TIGHAR's online community, said a post on the group's website. "It looks unlike anything else in the sonar data, it's the right size, it's the right shape and it's in the right place," a statement on the TIGHAR website said this week. "The resolution on the sonar does not suffice to conclusively determine what this is," Jeff Glickman, the forensic imaging specialist for TIGHAR, said in a phone interview. "It is unique, and suggestive of being man made. It is in the right place, but whether it's a fuselage or a wing is difficult to say," Glickman said. He added that "there is always the possibility" the image is of part of a boat that had nothing to do with Earhart. Richard Gillespie, executive director of TIGHAR, has theorized that Earhart's plane was washed off the reef by surf after Earhart and her navigator landed on Nikumaroro. Gillespie has said circumstantial evidence collected on previous trips to Nikumaroro makes a strong case for his theory that Earhart ended her days as a castaway, ultimately perishing in the island's harsh conditions. Items that have been discovered include what appears to be a jar of a once-popular brand of anti-freckle cream from the 1930s, a clothing zipper from the same decade, a bone-handled pocket knife of the type Earhart carried, and piles of fish and bird bones indicative of a Westerner trying to survive. TIGHAR did not say on its website when the group expects to be able to return to the island.